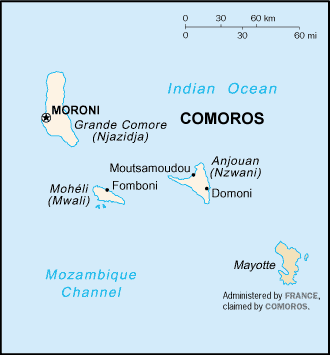 The Comorians live on a group of islands in the Indian Ocean between Madagascar and Mozambique, Africa. The Comoros chain consists of four main islands plus several smaller ones. 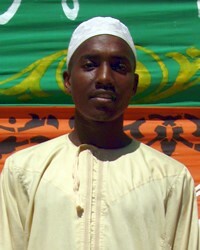 Comorian communities can be found on all of the islands in the chain, as well as in Madagascar. The different Comorian groups take their name from the particular island on which they live. The official name of the islands is the Federal and Islamic Republic of the Comoros. Until 1975, all the islands belonged to France. At that time, the three largest islands declared their independence but Mayotte, the fourth island, chose to remain a French possession. The basic diet of the Comorian people consists of rice, potatoes, corn, fish, coconuts, and bananas. Other crops are sweet potatoes, citrus fruits, and pineapples. Polygamy is an acceptable practice among the Comorian people. Children are expected to help with the farming, fishing, and caring of the animals. For recreation, the Comorian enjoy dancing, singing, and playing instruments, especially horns and drums. Between a quarter and one-third of all the Comorian live in cities; whether in rural or urban areas, however, housing on the island is generally of poor quality. Although French and Arabic are the official languages of the islands, the Comorians speak their own Swahili dialect. The Comorians are Shafiite Muslims, yet mosque attendance is very low. Mixed with their Islamic practices is a strong involvement in occultism and spirit possession. Traditionally, the Comorians have been very resistant to any kind of religious change; however, they are gradually becoming more receptive to other ideas. The physical needs of the Comorians are numerous. Major problems on the Comoros Islands include poverty, disease, and hunger. Educational levels are low and only slightly less than half of the population is literate. * Ask the Lord to grant wisdom and favor to missions agencies focusing on the Comorians. * Ask God to raise an army of intercessors for the Comorians. * Pray for completion of Bible translation in this people group's primary language.View Comorian, Ngazidja in all countries. Location in Country: Grande Comore Autonomous Island.